Using photos to understand history. We had some geography units for our students based around how areas have changed over time. Many of our students enjoyed comparing historical photos I found for the local areas they knew and current photos that I took of the same places. There are a few opportunities to make this a real life project and add to a global history project. The tools below could be useful for either history of geography if they were focusing on local studies. I also see potential for the information to be used in our language classes where they also look into the culture of the country. Back in 2010 I wrote about a tool called History Pin. It was created by “We Are What We Do”, a social action movement based in the UK (London) which is now known as Shift. History Pin was created in partnership with Google and is a tool looking at history with a timeline of photographs. Still supported, it allows users to upload photographs, date them and then slide the timeline through history to see the changes over time. Whether you are interested in buildings, transport or “life” from a particular time, History Pin offers you a glimpse into the past. It offered our students a great opportunity to do their own research and spend time with older members of their family, talking about the old photos in their family and making sure the stories they hear are kept for posterity. Some used it as a basis for family histories as they did the technical work and the older generations telling their stories/history. collect your own photos and it is recommended that they be outdoor shots. You can register by going to the homepage and clicking on the join button. You will need a Gmail address (you can get one from here) and once you have joined you use will use Google’s Picassa site for sharing photos. What Was There is a free online tool that makes use of Google Maps and the ability for people to upload old pictures of any location, add the date, and then pinpoint the location on a map and match it to the same view today. It provides a brief history of buildings that have long gone or still exist today. You can even look at a building or street via ‘street view’ and then it will overlay the old photograph on top, allowing you to fade the photo to reveal what it looks like today. It is simple to adjust the view to match the view in the old photograph as it uses eye-level street view tools. When uploaded you can fade from one view to another so you can see the changes appear before your eyes. This would be useful for pupils to see how streets around their home or school may have changed over time. They could contribute photographs or link from those elsewhere. It is being updated constantly with new photos. There is also an iPhone app available as well. Melbourne has a rich and vibrant history. Although not old by European standards there are many great stories about the city. In the 1800’s it was extremely wealthy and many amazing buildings were built to show off that wealth although there were slums and a seamier side as well. There is now a new way to explore the Melbourne of the 1800’s. 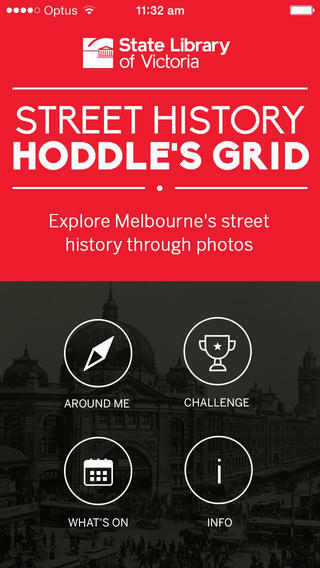 The State Library of Victoria has developed a new app that offers a way of understanding more about the history of Melbourne as you are taking a stroll around the city. You can explore the fascinating history of the area and look behind some of the beautiful Victorian architecture. By using your location to show nearby buildings, the user can view more then 300 photographs of street views and aerial photographs as well as read the stories about each location. Some of the photos are as early as 1840. There is so much to like: it’s free, it offers heaps of interesting detail. The only drawback is that it doesn’t have an android version. I can see it being of great value to our year 9 students when they are doing their city discovery week but only if they have an iphone or ipad. I love finding images interesting images and tools that help me find just what I am looking for. This is a very nifty little web-based tools that everybody should know about. 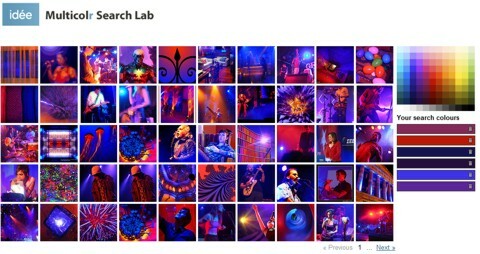 Multicolr Search Lab (Idee) finds photos on Flickr whose dominant colours match those which you can select from a palette at the side of the page. You can select up to 10 to be part of a set of colours. The screen shot shows the result when I selected 6 colors – shades of purple, blue and a red. The resulting Flickr pictures displaying a combination of these colors and some were quite amazing. With the photos coming from Flickr and therefore often licensed to use under creative commons they can go ion to be used on blogs or other websites. This is a boon for students especially when they can use Imagecodr to help them with attribution. In a world where many applications aim to everything for us I have found one today that does not. Min.us does just one thing, and it does it quite well, it shares images. As long as you’re using Firefox 3.6, Google Chrome or Internet Explorer 9 you can simply drag and drop images into Min.us. This tool is useful for anyone looking for a way to share pictures online without the hassle of logging in. You do not need to have an account to create an album and you have anonymous uploading as your IP is not logged. This allows you to create galleries without anyone knowing who created them. A direct link for each image that allows you to share a single image. However when trying to share a link to a specific image in a large gallery it took a long time because Min.us loads every image sequentially so it took quite some time to get to the required image. The tool might be useful for class or group sharing of photos. As you don’t need an account to log in, students don’t have to give any details and so can safely remain anonymous. The developers have stated they want Min.us to be a sharing platform for all media types (photo, video, audio, and documents) but it is still very early days. At the moment it is completely free but when dealing with such large quantities of data this may change. I like the idea for this book project “Teaching and Learning with Technologies” They are looking for pictures and illustrations for each chapter. A Flickr-group was started a while ago where people were asked to upload appropriate pictures under a creative-commons licenses. The L3T project collect creative commons licensed photos and illustrations about learning and teaching with technologies. The pics are collected to illustrate an innovative text book project, but are free to use for everybody. Please spread the world and contribute to the L3T group at Flickr. I like th idea because I know students who love to take photos and who have an interesting “eye”. How much more fun for them to to take photos that might be used for this project. It also provides an opportunity to be part of a group that is contributing photos that they might also want to use. It is easy to become a member and share photos with this community on Technology Enhanced Learning. TinEye is a reverse image search engine. It allows you to upload an image from your computer and search the Internet for it. You can also paste a image URL and find other places that the image exist on the Internet. The interesting thing about this tool is that you don’t have to remember, or have, the same file name. It not only searches the Internet for exact copies of the image but also any derivations of the image in question even if the image has been resized, cropped and manipulated with Photoshop or any other such tool. The stated goal of TinEye is to find all of sites/pages that use some form of the original image. When I first looked at this tool back in 2008 it was in beta format and it had a much smaller numer of images to search from. TinEye works by using Image Identification Technology, not keywords, metadata, and watermarks. The site currently has an amazing number of images indexed. It is very easy to use. You upload you image or put in the URL and within a few moments the results come up. Using it to check on students using images in a presentation but did not cite the source or as an aid to finding it again so they can cite the source. Alternatively students or teachers could use it to find better quality (higher resolution) images of their required object. It could also help with anyone (students) creating and publishing websites to ensure that they do not use copyrighted photos or images or images without permission. In Business Management: You could begin a search about a product or brand by starting with a photo and then finding sites that contain that image to get further information about it. Or making sure that an idea you have for a product has not been used before. In Language studies: Another use may be in studing a language such as Chinese where it is character based. Taking a photo of the character and loading it in to TinEye may help you fnd the translation more quickly than the traditional dictionary. All the students would need is a camera in their phone and nowadays what phone does not have this! There is now an official TinEye extension for Chrome that works on Windows and Linux. Google Maps allows you to develop a feel for an area and its surroundings when you use their street view options but what if you are interested in the development of an area over time? We Are What We Do, a social action movement based in the UK (London), created Historypin in partnership with Google may just offer this option. One of the aims of We Are What We Do was to get people from different generations to spend more time together….old photos are a great way of gathering people together and getting them chatting. So, we decided to create a website where people everywhere could share their old photos and the stories behind them. We wanted people to dig out, scan, upload and pin their photos and stories to a map of the world for everyone to see. We also thought it would be neat if you could compare these old photos with how the world looks today, making the site a bit like a digital time machine. It has the potential to become the largest user-generated archive of the world’s historical images and stories. Web users are asked to contribute to the site by uploading their archive photographs and geo-tagging them so they will be linked to a specific location. You are encouraged to add the stories behind the photo as well and thus building up a visual history book. So Historypin will enable you to pin your history to the world and see what others have posted about events and stories throughout the passage of time by using the time slider. We some geography units for our students that are based around how areas have changed over time. They have always loved the comparisons between the historical photos I found for local areas and current photos I went out and took of the same places. This would be a great opportunity for them to do their own research and spend time with their parents and grandparents, talking about old photos in their family and making sure the stories they hear are kept for posterity. They could do the technical work and the older generations relate the stories/history. I also see the information of use in history classes and our language classes where they also look into the culture of the country.